UPDATED The Téléfrance service on Vision TV Network's Freeview portal is to end on the 3rd April 2014, according to an on-screen announcement. The service, which provides free-to-air access to the French language version of news channel France 24, plus subscription access to French public service broadcasters France 2, 3 and 5, via Freeview channel 225 will continue to be available via ROKU, iOS and Android. Vision TV Network can be found in the international section of the Roku channel store. Vision TV Network is part of Freeview's streamed channel section for connected Freeview HD devices and is operated through Arqiva's Connect TV service. 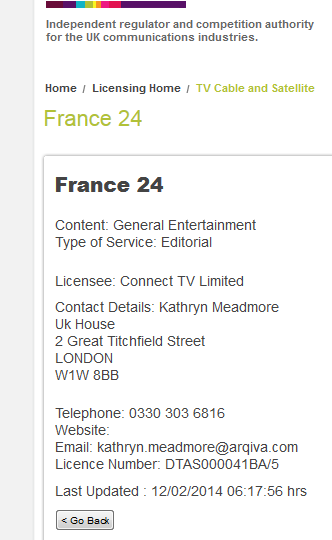 Connect TV received a licence to carry France 24 as a separate streamed channel by Ofcom (pictured); this has been removed from the Ofcom digital terrestrial television licence list in the past week. France 24, is however, one of the channels carried by TVPlayer's online and mobile service. TVPlayer has announced its impending arrival onto the connected Freeview platform. Details about which channels TVPlayer will carry on Freeview has not yet been confirmed. Television without frontiers from the EBU have not really come to fruit - Useless really unless it is News! France 24 is almost certain to continue so a good thing and I would recommend France 24 having both French and English versions like Virgin Media!